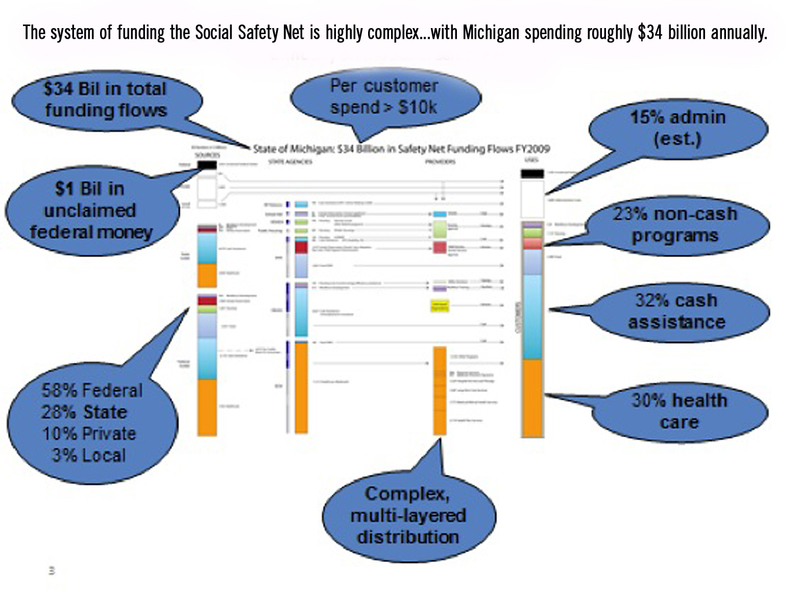 The graphic above illustrates the flow of $34 billion in the state of Michigan that is used by the government, non-profits and foundations to help individuals in the Safety Net. It leaves me frustrated. All are well-intentioned efforts, yet we aren’t making the progress on issues of hunger, health, shelter and a myriad of other basic human needs. Why? I have come to the conclusion that progress, or lack there of, isn’t a money issue — though money is critical. The barrier to progress isn’t a talent issue — as the sector has plenty of dedicated and talented professionals. The core barrier is a design issue. Often, the helping sector — both government and non-profit — identifies the problem without deep analysis or engagement of stakeholders. In turn, we often rush toward a large-scale solution without fully pressure-testing different options. And rarely do we see the focus on the root cause or the system as the top priority. Rather, we treat the symptoms of the problem with services and other tactics. The reason design must be used for driving social impact is that it gives us a new way of tackling problems. Design thinking encourages us to take a divergent approach and to explore new alternatives and new solutions. In times of great change and complexity, which we face today, we need new alternatives and new ideas because our existing solutions are becoming obsolete. Most of the caring systems today — food stamps, workforce development, mental health, etc. — are designed around the institutions that are delivering the service or dispensing the financial resources, rather than around the people who are receiving the service. When we identify a problem to be solved, we need to start with the human needs, not the institutional needs. Garnering a deep understanding of the culture and context of the individual in need is essential before we even know where to start on ideas for solutions. For example, I recently had the opportunity to visit IDEO, a design and innovation firm, who was helping the city of San Francisco with increasing disaster preparedness of all of its citizens. 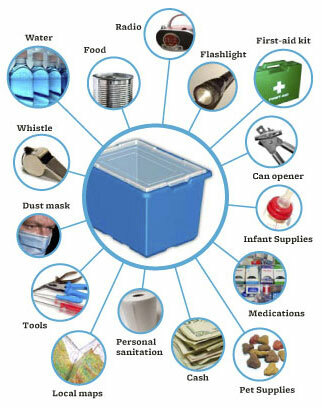 When we think of being prepared for a natural disaster, we often think of flashlights, whistles and bottled water. SF72. This is our city. from crowcrag on Vimeo. Doing the same thing over and over and expecting a different result is the definition of insanity. When we find ourselves doing this, we must admit new tools in the tool box are required. Design methods are tools that have been created to solve difficult and complex problems. Traditionally, the problems have been focused on products of consumption (phones, buildings, etc. ), not on addressing our most challenging human needs. Today, we are beginning to see a shift take place. Design isn’t just about objects, rather, it is increasingly about improving the lives of people throughout the world.